🔥 Rise from the ashes . 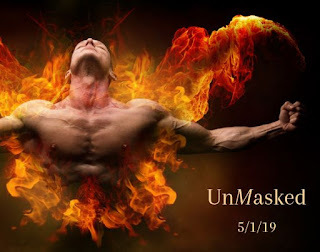 . . 5/1/19 🔥 UnMasked . . . exclusively in the Saved Between the Sheets Anthology 😈 Blurb: Some secrets aren't mean to stay hidden. When Veronica Valente, the daughter of the famous crime lord rebels against her strict and overbearing father, she seeks a night of pleasure to forget the mess her life has become. Geron's dark mask hides a painful past. When revenge becomes his only objective, he'll be faced with a choice that could ruin all his carefully constructed plans. Explosive passion and dangerous lies collide with raw need and practiced seduction. Which one will keep their true identity a secret and who will be . . . UnMasked? The call has been made, BTS City needs help! Hang up the cape but leave on the mask for these steamy tales. Heroes come in all shapes but what makes them super is the size of their....hearts.